Laboratory...Offering you a qualified team of staff members! We know that visiting the laboratory to have tests run can be intimidating. But rest assured that we are your neighbors, friends, and family; and we have your best interest at heart. Our goal is to make you as comfortable as possible and to allay your fears. 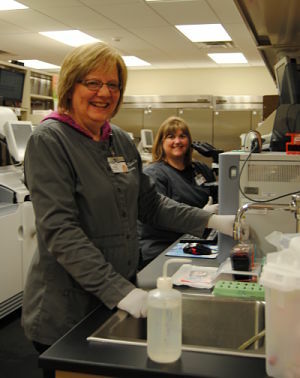 Our phlebotomy team is certified and licensed by the state of Montana, and has over 70 years of combined experience! Our technical team has earned bachelors degrees or higher, is certified, and holds state licensure. Our pledge to you is to be here when you need us; be caring and compassionate; and to treat you with the dignity and respect that you deserve. Our state-of-the-art laboratory equipment, along with our highly trained and professional staff is your ticket to the best possible care. This combination ensures shorter turn-around times, providing you with faster results than ever before.